The Moscow Patriarchate has flatly denied information that the Church is merging with the state in Russia. "The Russian Church has never in its history been so independent of the state as it is now. It treasures this independence. However, it also treasures the dialogue that it has with the modern state. No doubt, this dialogue cannot be called easy, but it can be called constructive," Vladimir Legoyda, the head of the Synodal Information Department of the Moscow Patriarchate, said on Friday. 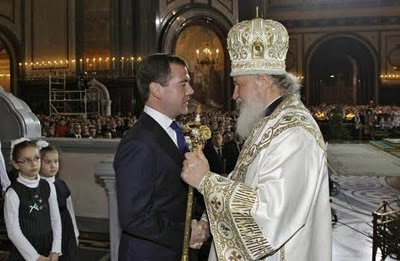 Legoyda said the fact that the Patriarch regularly meets with top Russian officials does not mean that the Church does not have "difficult conversations and problems in its dialogue with the authorities." Legoyda said attempts are being made to make the Church "an opposition force and there are some political and public figures who will always be negative about the Patriarch and the Church until they start speaking negatively about the authorities." These people "do not fully understand what the Church is and what its purpose is," he said. "They expect the Church to follow the logic of a political party, which in their opinion has to be an opposition party. However, the Church will never become a force that is in opposition to the administration. The Church had relations with the state even under the Soviets. Why shouldn't it have relations with the state now? However, what the Church has always done and will continue to do is to give a moral evaluation to the state of society and the actions taken by the authorities and politicians," Legoyda said.